The process of inspiration starts. Day 7949 of My Life: consider leaving the warm, cozy confines of my bed for 20 minutes, realize I will be late to class once again, and run to the kitchen to microwave my usual boring gruel of hot high fiber cereal with a mashed banana and a swirl of agave syrup to survive the next couple of hours of class, library, class. Day 7950: Instead of lying prey to the Wegman’s international food aisle on my most recent shopping trip, dazzled by the imported foreign delights like Digestives from the U.K. and Italian biscotti, I decided to splurge on my usual frozen vegetables and purchase a jazzy bag of diced butternut squash, mixed with shredded spinach, cranberries and drizzled in an olive oil garlic herb basting sauce. Day 7951: Back to my hot high fiber cereal. Day 7952: Start the day with hot high fiber cereal again. Rolled down to the new Indian mini-mart and bought some Indian paratha, or unleavened flatbread, and the usual dozen of eggs business. Paratha is savory in taste, soft in texture, crisp when warmed. Day 7953: And like a novelist overcoming the dredges of writer’s block and achieving that single, spontaneous blow of plot inspiration, I too experienced a culinary epiphany to save me from the monotony of my usual breakfast slop: a trifecta of olive oil fried eggs, diced butternut squash-spinach-cranberry blend, lovingly wrapped in warmed paratha bread to complement it all. Boil butternut squash until softened, about 10-15 minutes. Drain. Sauté spinach, garlic, red onion, cranberries and squash in olive oil until spinach has wilted and onions become translucent. Add spices. Remove from heat. Warm paratha in a skillet on medium heat, about 2 ½ minutes on each side. Remove from heat. Fry egg sunny side up or over easy in remaining oil from vegetables. 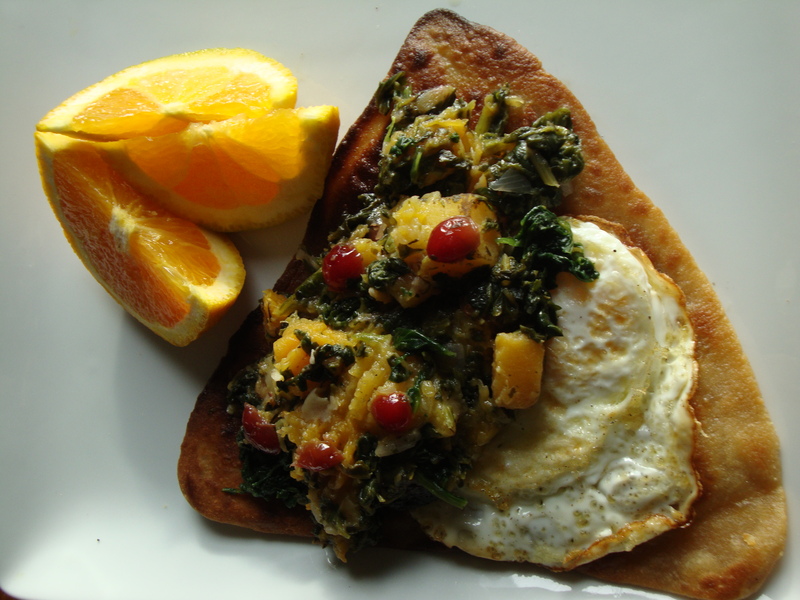 Arrange fried egg and ½ cup of Wegmans Food You Feel Good About Roasted Butternut Squash & Spinach Special Blends or cooked vegetables on warmed paratha, and roll like a burrito. Serve.